Wayne Ellington gives the Pistons what they lost in the deal that sent Reggie Bullock to the Lakers – a veteran elite 3-point shooter. AUBURN HILLS – Ed Stefanski’s deliberation over whether to sell the last two months of Reggie Bullock’s service to the Pistons for two long-term assets would have been considerably eased had he known the other shoe about to drop. The next day, Miami dumped salary by dealing Tyler Johnson to Phoenix for Ryan Anderson’s expiring contract with Wayne Ellington the collateral damage required to balance the deal. The rebuilding Suns had no interest in retaining Ellington and – ta-da – the Pistons won a pitched recruiting battle for the veteran sniper. How they won that battle – over a host of contenders, including rumblings that franchises like Golden State, Oklahoma City, Philadelphia, Boston and others were poking around – is a story of teamwork from ownership to upper management to Dwane Casey. Pistons vice chairman Arn Tellem was once Ellington’s agent before Tellem left the business to run the franchise for owner Tom Gores. Josh Bartlestein, Pistons vice president of strategy and chief of staff, is the son of Ellington’s current agent, Mark Bartlestein. They enlisted Gores’ services, too, and his phone conversation with Ellington’s wife, Safie, helped close the deal. Ellington, 31, has played for seven franchises since being drafted in the first round by Minnesota in 2009. He was part of North Carolina’s 2009 NCAA title team, scoring 19 points in the championship rout of Michigan State at Ford Field, hitting all three of his 3-point attempts. He’s been traded once in-season – in 2013 from Memphis to Cleveland for current Pistons teammate Jon Leuer – and all of that experience should help him hit the ground running with the Pistons, who went into Sunday’s play a half-game out of the No. 8 playoff spot in the East. Ellington could wind up sliding into Bullock’s vacated starting spot – filled by Langston Galloway in Friday’s win over New York – but whether he starts or comes off the bench, his addition gives Casey another needed weapon for a team that’s shown signs of a breakthrough. 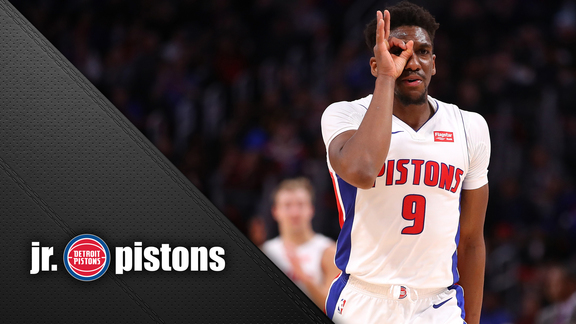 Over their last eight games – which coincides with Reggie Jackson’s turnaround – the Pistons are No. 5 in defense and No. 17 in offense. For the season, the Pistons are No. 9 in defense and No. 22 in offense. The team the Pistons must first vault to put themselves into the playoff field is Miami, where Ellington played 164 games over the last three seasons. Ellington will be a free agent after the season and the same forces that helped the Pistons win him over this time will remain in place then. But that’s a decision for another day.